In our earlier report we had mentioned that INDIA VIX and RSI were indicating markets are pricing in some undue announcement. We have seen the S&P downgrade which came up over the weekend. So the criteria for a catastrophic fall in Nifty was in place and now technically the capitulation should either get over at 4900 or 4700-4775. 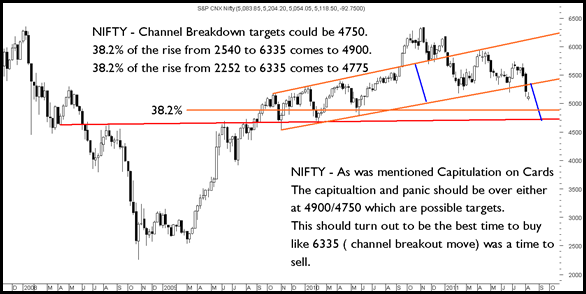 The channel of 600 points was broken at 5300-5350 which gives us a target price of 4700-4750 which can come in panic. Also the 38.2% retracement of the move from 2540 to 6335 comes to 4900 whereas if we were to take the bottom from 2252 to 6335 comes to 4775. We expect the capitulation to be over in this week or by next week with downsides being capped either at 4900 or 4700-4750. One can initiate 50-60% buying at 4900 and 4700-4750. Top Picks in the index are as follows which can be bought at + -2% from the given levels. SBI at 2100, Axis Bank 1150-1180 , Bajaj Auto at 1320, Dr Reddy 1500, HDFC Bank 440, HUL at 305 , Jaiprakash Associates 55, LnT 1550, 740. We have initiated a model portfolio for clients today. What about hindalco ,, pls give ur view..
Religare chart sense please ? pl. send me a link of EOD data, or should i make the payment first. pl. let me know as i have sent emails twice. thanks. technical chart sense on religare, motilal Oswald, edelweiss please? Please let me know what you think about IFB agro? In your article ” Now is the Oppurtunity ” you advised buying various scrips around a certain prices . Among those you forgot to mention the name of the last scrip whose price you gave as 740. So will you please let me know the name of that scrip .